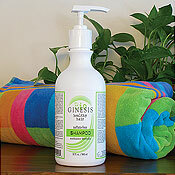 Ginesis Healthy Hair Natural Shampoo is a product made from only the highest quality natural ingredients. This shampoo contains natural healing oil that eliminates the need for harmful emulsifying chemicals found in all other shampoos. Cleans your hair naturall. 16 ounce size. Ginesis Healthy Hair Natural Shampoo is made from only the highest quality natural ingredients to help your hair look its best while maintaining a healthy scalp. Natural and sustainable ingredients and a unique formulation process allow the shampoo to be compounded without the use of harmful chemicals such as sulfates, glycols and artificial colors. When you use shampoos that contain such chemicals, they not only can damage your hair follicles but can also penetrate the skin-barrier and be absorbed into your tissues. Ginesis has developed a natural formula that can correct oily or dry scalp, itching, flaking, hair discoloration and other hair issues often caused by chemicals. Regular use of the shampoo will leave your hair moisturized with a silky shine. Those who have damaged hair and scalp from chemicals found in common shampoos and would like a shampoo that safely rejuvenates naturally. Is sensitive to chemicals and needs a shampoo with ingredients that are non-irritating. Sizes available: 8 oz, 16 oz, 32 oz (shown in picture) and 128 oz. When you use shampoos that contain chemicals such as sodium laurel sulfate or propylene glycol, your hair follicles themselves are damaged and your body is constantly trying to repair itself. Because these caustic chemicals cannot be washed off our bodies with water they actually penetrate the skin-barrier and are absorbed into our tissues. This absorption process can cause the sebum of the hair shaft to become crystallized, effectively closing the hair follicle. The resultant induction of skin tightness of the scalp severely reduces life-giving blood flow to the hair follicle!. Over a period of time the crystallized sebum prevents the re-growth of healthy hair. As a further result of this damage by chemical emulsifiers the hair follicles itself deteriorates and can no longer produce hair! The result is thinning and receding hairlines in both men and women. When Ginesis Shampoo is used regularly instead of products that contain sulfates, propylene glycol, olefin sulfate, artificial colors and salt - the scalp environment is enriched and the body responds by 'healing itself'. A hair follicle can stay 'alive' for up to ten years without a hair growing from it. Therefore, the Ginesis product can sometimes appear to make hair grow, but in reality it’s an all-natural way to remove the offending ingredients that have been proven to cause hair loss. In addition, hair loss caused by chemicals will stop within a few short days and your scalp will return to its normal healthy state! Apply a shampoo to wet hair and thoroughly massage into scalp and hair. Lather is minimal due to absence of synthetic detergents. Rinse thoroughly with chlorine-free water if possible. Towel dry.